Next to heating, cooling the still is the most important operation. Both stills in this guide are cooled with a supply of running water. But because of their different approaches to controlling the reflux in each, they both have different cooling requirements, consume different amounts of water, and require somewhat different operating procedures. Regulating the cooling supply in this model is critical. That's because this still relies on the cooling supply to control the amount of reflux that is circulated in the column. Having too much or too little cooling circulation will directly impact the purity of the distillate and the time required to produce it. Estimating the right amount of cooling is difficult because of the many factors involved. 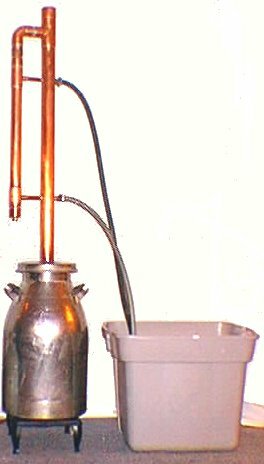 Working from actual distillation runs, it takes about six hours to distill about 5 liters of 190 proof ethanol from a 25 liter boiler charge. Six hours of running tap water through the still can amount to a lot of water. Perhaps enough to worry some country folks about running the well dry or filling up the septic tank, or even burning out the pump. On the other hand, except for the water bill, the cooling supply and drain from the still is of little concern to those who have city water and sewage lines. Regardless of which situation you find yourself in, if you want to conserve water consumption, you may want to consider using a holding tank. In this configuration, cooling water is contained in an intermediate tank or vessel, and then pumped through the still, with the discharge from the still directed back into the tank. There are a number of pumps that can be used for this purpose. The one shown on the left is a standard submersible sump pump. It pumps or circulates about 2,000 gallons/hour. When fitted with a "Y" valve at the pump outlet, it will allow you to direct the water flow to the still, or alternately, to pump the water in the holding tank to an outside drainage. In the course of a distillation run with this still, you will need to refresh the cooling water 3-4 times to keep it cool. 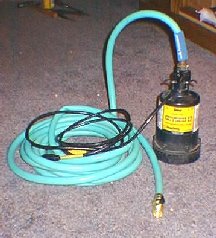 A hose connection from the tap to the tank is convenient for this. The problem with using a holding tank is that the temperature of the water continually rises during the course of a distillation. As it rises, the condenser and internal cooling tubes become less efficient at condensing the vapors. To compensate for this you will need to either increase the cooling flow rate, or refill the tank with cooler water while the distillation is in process. Control of the cooling with the valved reflux still is much simpler than with the Internal Reflux still. This is because the cooling flow does not affect the reflux flow in the still. The only adjustment to the cooling flow that needs to be made is to insure that there is enough circulation to completely condense the vapors surrounding the coil, and the heat is low enough not to drive the vapors past the coil and out into the atmosphere.